Kittens, we have reached the last day of November, and I am so happy that it ends with easiest post (apart from WIP it Wednesdays)! I knit slightly more then I did in October, which pleases me. November got off to a very slow start and I was afraid it might be my lowest yield month of the year. Now onto December! In fantasy land, I’ll knit the over 3,000yds needed to average 1 mile a month for the year…but realistically, I know that will not happen. I have nothing today, kittens. Talk amongst yourselves. Kittens, where I live it is still Sunday. As such, I’m making a fluff post today. 28 days of consecutive blog posts have drained me. Some knitting happened today and a little crocheting. Tomorrow, I hope to have something a bit better. Some sunshine for my sister, Amy. We’re trading services. For my end, this will be a Sockhead Hat. Down the line, I’ll update with what I get from her. What’s really cool is that the cost of materials and hours of labor for both projects is nearly identical. Kittens, I hope you all slept in and are avoiding the craziness which is Black Friday shopping today. At Chez Knitpicking, we’re doing just that. My morning started with drinking chocolate and writing up a blog post. 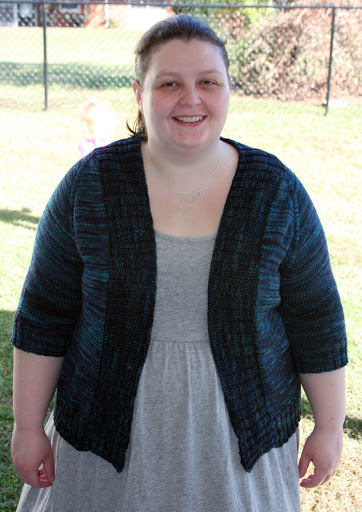 Yes, kittens, The Dreamy Basic Cardigan has finally been photographed so I can blog it! Please pardon the squinty smile. We went from foggy and dreary to so sunny my poor eyes could not handle it. I’m very sensitive to sunlight, and you’ll find me sporting sunglasses, even on cloudy days. So what can I say about Dreamy? The pattern is nothing special, just an improvised top-down raglan cardigan that isn’t meant to be closed. (Though it is wide enough that I could close it if I’d like to add some sort of closures.) The lazy part of me is digging this current trend. I’m sure you’ll be seeing more cardigans without closures from me in the future. I used the starting numbers from my, “You Down with AOB?“, as a jump off point to start the increases. It worked out really well and I’m very pleased with how this fits. The true star was the yarn: Sundara Sport in an LE colorway I picked up in September 2009. This yarn wasn’t what I was expecting when I opened the package, and I had to make peace with it before I could put it to use. At the time I purchased the yarn, the dyer had recently switched over to doing her own photography and photo editing; to put it kindly, there were…issues with photo accuracy. She also wasn’t the most gracious about accepting that large numbers of her customer base were complaining about the change and went on the defensive, but that’s a story for a different time. When I saw this colorway, Dreams Have Invisible Wings, on the site, it was a bright blue green. You can see highlights of it in the yarn, but it had looked like a consistent semi-solid of that color. Imagine my surprise when I opened my package to find a dark yarn, mostly black with navy and flashes of the bright blue green. This was before Sundara implemented her return policy and I sat there baffled about what to do with such a variegated colorway. I thought about destashing, but after showing off the color on the Ravelry board, most others had the same reaction to it I did. 11 months later, I finally decided to pull it out of my tote and use it for a basic cardigan to show off the colorway. Of course, I alternated skeins to avoid pooling. I probably should have alternated 03 at the same time rather then 02; there is some minor color pooling despite my efforts. Later, I realized that I hadn’t left enough of the lighter skeins to go with the darker ones and the ribbing for the sweater is noticeably darker. As for the yarn itself, I love it. Hate the price tag, but love the yarn base. Out of 05 skeins, there were 02 knots and no schlubby bits. 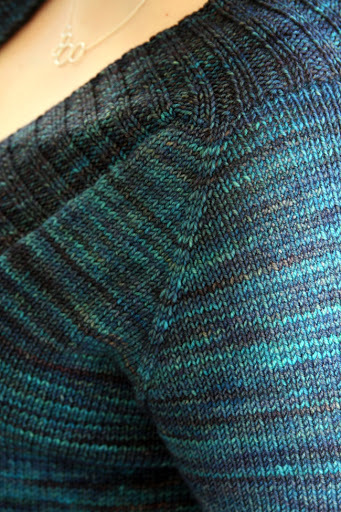 I have two more colorways of this in-stash, and I’m hoping to crack into another after my current project is finished. It’s soft and has nice stitch definition from the plying. At the gauge I knit it, it has lovely drape but is still opaque. Good yarn all around. Sundara has recently added a less expensive Sport Merino 2 to her site, but I resisted the temptation to purchase from the first round. When she brings it back, I’ll nab some in the future and see how it compares. Overall, I’m very happy with this knit and I’m looking forward to getting more use out of it when the weather decides to trend cooler again. It was 80º yesterday, kittens. 80. Hope you’re having a good one full of yummy foods, kittens. Will be back to craft blogging tomorrow. My garter yoke, it’s getting there! I’m about to pick up the stitches for a sleeve and work my way through the question that has been hounding me for the better part of the week: how long will the sleeves be? It’s a validly tricky question. On the one hand, it likely will not be freezing cold for much of the winter and I’ll get more wear out of this if I keep the sleeves shorter. 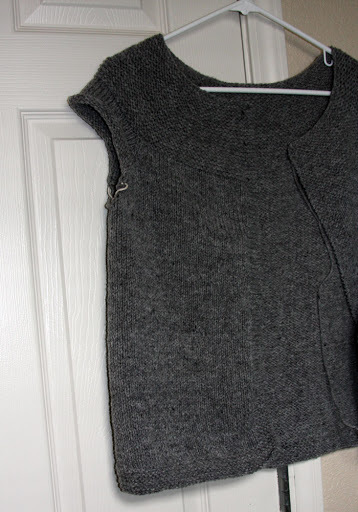 On the other, this is a nice warm wool, and even with short sleeves, it’s likely to be a piece for only the coldest months, so I can cheap out avoid buying a winter coat if I keep the sleeves longer. 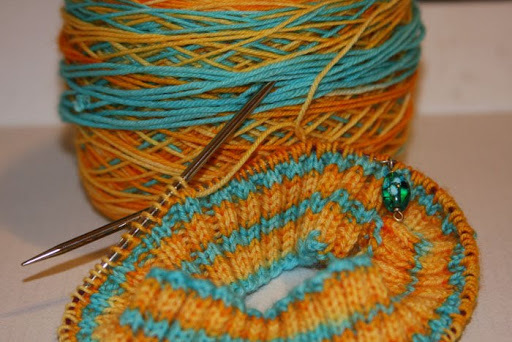 I guess I’ll see where my whim takes me as I knit the first sleeve….